Rendering lard is a lost art – a worthwhile technique forgotten in a fat-phobic, Lean Cuisine-centered culture. Many cooks, seeking out local foods and forgotten traditions, have rediscovered how to render lard in their homes. Learning how to render lard needn’t be a difficult task; it requires clean fat, clean water, a good stock pot and a quiet afternoon in the kitchen. The reward of a beautiful, creamy white jar full of freshly rendered, pastured lard is worth the minimal effort. Pastured lard is a remarkably good source of vitamin D and of monounsaturated fat – the same fatty acid found in olive oil and avocado that is heralded for its benefits to cardiovascular health. Odd that lard, given its fatty acid profile and vitamin content, earned such a bad rap over the last few decades. Like many wholesome, nourishing fats, lard seems to have been swept aside for a time, but it’s quickly earning a much-deserved renaissance – ensuring that taking the time to learn how to render lard is worth your effort both in terms of its redeeming nutritional value as well as in celebration of the wealth and variety of your local foodshed. Hogs, and their nutrient-dense fat, are widely available. I prefer to render lard on the stove top, so if you're learning how to render lard from this method, take care to ensure you have a high-quality, heavy bottomed stock pot. Two and one-half pounds of fresh leaf lard or hog fat will produce approximately one-half gallon of creamy, nutrient-dense fat. With a sharp knife, trim any blood spots or remaining meat from the lard. Chop the fat into ½-inch cubes. Add the chopped fat and the filtered water to a heavy bottomed stock pot and simmer over medium-low heat, stirring occasionally. After about 45 minutes to one hour, the water will evaporate, the fat will begin to melt and the cracklings - little bits of browned fat - will begin to float to the surface of the pot. Continue to gently stir the melted fat periodically, taking care not to let it splatter. Eventually those cracklings will sink to the bottom of the stock pot, at that point you may remove your pot from the heat. Line a fine mesh sieve with a 100% cotton cheesecloth and strain the melted fat, reserving the cracklings for another use (they're quite nice salted and eaten as a snack or served in place of breadcrumbs in a gratin). Pour the melted fat into mason jars and allow to cool. The melted fat will be golden-brown in color, but, when cooled, will appear a creamy white. Use your freshly rendered lard in pastries or as a fat for braising vegetables or seasoning meats. You have created a lovely blog–chock full of good information and beautiful photos. FYI: This post appeared as a full feed, not as a summary, in my reader. Thank you! After discovering a dairy intolerance in my son and being woefully sad at losing the butter option for cooking fat, I purchased 3 lbs of pork fat from the local ranch/dairy. I have yet to render it. Your post is timely in our world. Thank you! Have you thought of using ghee (clarified butter), which is the pure fat without the proteins that usually are the cause of dairy intolerance? Speaking froma medical perspective, it’s actually not the fat, or the proteins that cause lactose intolerance, which is the most common issue with cow’s milk. There are other issues, such as allergies, which are to the proteins, but that’s nowehere near as rare. If you’re caucasion for instance, you have about a 20% chance of being/developing lacotse intolerance, african decent closer to 80%, and asian decent almost 100% chance. The problem is from the actual sugar, which called Lactose, a double sugar (disaccharide) composed of glucose and galactose. While milk itself generally has most of the sugar, all dairy products will have some amount, even after clarification of the butter, and regardless of whether the butter is home-made. If there is adifferent problem, such as allergic reaction, there isn’t a viable cure, except for very low doseages, in the hopes that the immune system stops treating the proteins and other nutrients as foreign bodies. The benefit sought after with the pork lard, is that pork has neither the same proteins/nutrient combinations, nor does it have the lactose which needs to be broken down. Speeking as a hard-core dairy lover, recently diagnosed with lactose-intolerance, a viable option however, would possibly (depending on the individual person) would be trying yogurt in place of creams/milk/cheeses, because the bacteria used for culturing the yogurt feed off the lactose, and break it down into it’s individual saccharides, (galactose and lactose) which do not need to be broken down by the digestive tract. The glucose is already prepared for use by the cells and brain, while the galactose is easily (well, non-chemically speakng it’s easy..) converted into glucose by the liver. If you have the option to watch a Food Network show called Good Eats, the episode 4 from season 6 is actually all about culturing your own yogurt, and using that yogurt to make dressings, cream sauce and cheeses from it. (Actually watched it yesterday coincidentally..) And I culture my own yogurt every couple weeks in 2 gallon batches. It really is quite simple, tastes better than store-bought yogurt, and is about 1/4 the cost too! Or you can go for Raw Dairy which keeps the milk proteins intact and the lactase isn’t destroyed by pasteurization which is the main cause of lactose intolerance, the lactase not being present for your body to process the lactose. go to westonaprice.org for more information! Also think about trying raw milk butter. Its easy to make on your own and the majority of people with a milk problems dont have problems with raw milk and raw milk products. Highly recommend the yogurt or kefir route, if you are keen to keep using dairy. Not only does the fermentation reduce the lactose by around 50%, it also gives you the probiotics needed to help you process the rest. I would love some good lard, but I don’t know where to get the fat! Here’s a related question: I have bags of beef bones in my freezer from my grass-fed cow purchase. When I roast them to make broth, lots of fat comes out. How can I use that? Is there another/more preparation that needs to be done with the tallow? I’d roast the bones gently so you don’t burn the fat, then strain it and use it for whatever. I used some for some sauteed red cabbage I made the other day and it was delicious. I have found that lard can become rancid after a few months, so I wouldn’t get too fat ahead on my supply of lard. I had some fat from a pig in the freezer but didn’t get around to rendering it for a long time. When I did, it just wasn’t very good any more. Kris, could one actually can the Rendered lard? I know it freezes really well (schmalz, that is not just pigfat). That is what I do, when I make it. I don’t use it for much but the recipes traditionally calling for it (like kale and red cabbage[German here, living in the DC area now..lots of things can only be obtained -if at all possible at horrendeous cost]) I freeze it in thinnish sheets and when if has cooled a bit is use chopsticks to freeze it in a way which makes breaking what I need off in teh frozen state simple….but…could one can it? what do you think? You can get it from any butcher shop. I just had a hog processed and had them save it for me. They were suprised, said not too many people ever want it anymore. Some may even just give it to you. I wouldn’t buy it from any butcher, only one that could give me organic, grassfed animals, as the fat would contain a lot of the toxins from bad feed and pesticides, antibiotics and whatever else they put on animals these days. Ask your local butcher to save you some pork fat.Usually they will,and also it’s usually free! Your great photos make the lard look luscious! Time to render some more lard! Another wise post… pigs should root in the ground… eat roots and bugs and, most famously in the finest spanish ham, acorns as well as vegetables and grains. When fed this, the fat is sweet and delicious. Good for you to bust the bad myths!! I do not eat pork…can it be made with beef fat? A good substitute is Goose or Duck Lard. They make very tasty crusts. You can render beef fat,but I think it’s commonly called tallow. Lard is rendered pork fat. As a solid Lard is white. You are doing right by buying it and just using it. I’m not certain, since I’m not the seller, but I imagine if it’s butter-like, it’s already rendered. The pork fat is just that, fat. It’s going to have a totally different texture/consistency than if it’s been rendered. As fat it will be just like if you’d just trimmed it off a roast or chops, but as lard it will be more of a cream, or spread type of consitency. I cannot believe all these years I never cooked with lard. I thank God for blogs like yours who share this wisdom and encourage us not to be afraid of fat. just wondering how long lard lasts??!! should it be refrigerated or does it matter? The lard, like any other fat/oil, will have different shelf life depending on a lot of different variables, temperature, oxygen, and light being 3 of the most important issues. Lard is for the most part fairly shelf stable, but as mentioned, it’ unsaturated, which is why it’s good. The problem with it though, as with all unsaturated fats/oils, from a chemical standpoint, is that the unsaturated portion, actually wants to be saturated. So if there is an atom floating around loose (loosely refered to as an oxidants, or free-radicals) it will bind to it, and thus becomes rancid. Increased amounts of heat, light and air all either have and/or create free-radicals, and thus cause it to go rancid faster. Dark, cold, and as free of air as possible will all help to keep the lard/tallow/other rendered fats from going rancid for longer. Freezing isn’t going to do too much for it though, because the ‘freezing point’ being referred to is that of water, not of say a fat. At the point of freezing water, (0 degrees C) fat is actually not frozen. It will slow the process down, but no more than having it in the refridgerator will, which is why a comment above mentioned it having gone bad in the freezer. That being said, storing it like all other canned/bottled foods, in a cool dark room it will still store for wuite some time, quite possibly for several months. Just pay attention to it, and when it starts to smell off, toss it and get some new.. Thanks for sharing this. I was wondering about freezing rendered fat – I thought it would last forever, but I guess not. At least it will last a lot longer. Thanks! I store my rendered lard in the freezer in one quart glass containers until I’m ready to use it. I’ve had it in there as long as nine months and have never had a problem with it going bad. The lard is good enough to eat. If the lard is smooth and creamy, it’s likely already rendered; however, if it comes in big slabs of fat then you will need to render it yourself. I bet you anything that the lard you’re using has already been rendered. Some people recommend storing lard in the refrigerator. I don’t generally do so. Lard is a pretty stable fat, like tallow or olive oil since it’s primarily comprised of saturated and monounsaturated fatty acids rather than the sensitive polyunsaturated fatty acids that are found in vegetable oils, flaxseed, hempseed and fish. I’m not too sure how long lard generally lasts, because we use ours so quickly. Good fat, in general, is stable and tends to last a long time. When you are rendering 40 pounds of lard you really do want to freeze some. An answer to how long Lard lasts………..I render my lard down then, while HOT, strain it into sterilized qt jars. put on the seal, ring and as it cools it seals! It will last for YEARS when ‘put up’ this way. You can do this same procedure when making ghee. Awesome to know this, my freezer is full and I was trying to figure out what to do with it all. Thank you so much for your warm and thoughtful comments. Cooking with lard has been such a pleasure. It is so well suited to a vareity of cooking methods and it offers a phenomenal flavor. We recently did fried chicken livers in lard and that was just divine. If you don’t eat pork, you can absolutely apply this method of rendering fat to virtually any other animal fat. I use the exact same method when I render beef or bison tallow and it renders beautifully. Thank you for your warm comments about the photos. I’m just getting the hang of photographing food. Real food is so beautiful. I hope that one day I can do it better justice. Do you know if your son can tolerate ghee? Since the milk solids are removed during the rendering process, many people find that they can handle it quite well. Of course, as with anything, your mileage may vary. How is rendered lard different or similar to bacon grease. After we strain it ours looks the same as the lard pictured. We use it to fry chicken, for gravy, and general cooking. Thanks for the info and great post! the difference between rendered lard and bacon grease is simply that the bacon has been cure/smoked and so will lend a bacon-y flavor to the fats that are left after cooking the bacon. Also, bacon usually gets much hotter than lard while it is rendering out of the bacon during cooking and this also can change the flavor. We use bacon fat for frying eggs, in beans, corn bread and other dishes that would be enhanced by the wonderfulness of bacon flavors. 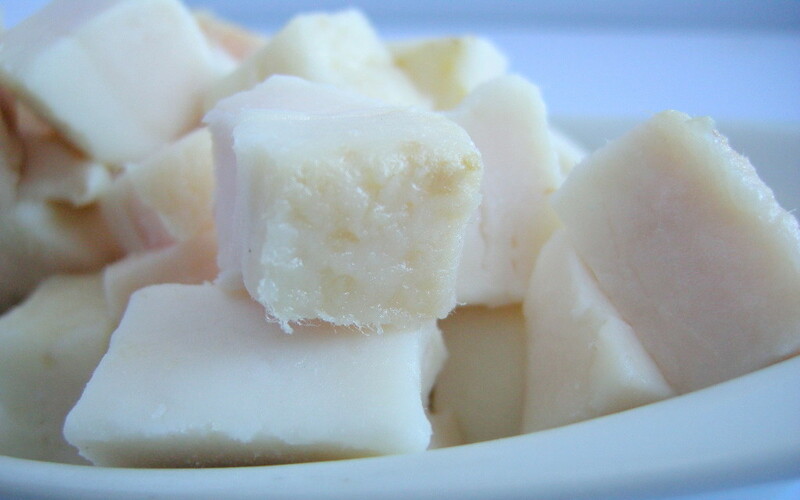 We use lard when a neutral flavored fat is called for or when a larger quantity is called for. I jealously guard my bacon fat and threaten the household if I think it has been used for a frivolous use! Thank you so much for your great comments recently! Nourished Kitchen is definitely a labor of love, for certain. I’m still working on the RSS issue, so thanks for giving me a heads up! I can’t wait to get a hold of some pig fat and try this! I would have fainted of shock at that last sentence three years ago, thank goodness I found the traditional way of eating. My sugar cravings are nearly zero and I found out that all my body wants is real food. just a note, before Christmas I went to Whole Foods and asked at the butcher counter if they had lard and I might as well have been escorted from the store, they were shocked and appalled. I guess we are all ahead of the ‘times’! Kim, I had the same experience at Whole Foods, LOL! I had the same experience at Whole Foods. I’m kind of at a loss as to where to find quality pork fat. For us “newbies”… it can be overwhelming trying to find stuff like that. Which brings me to my question, my local asian market sells tubs of lard – is that acceptable? What about the stuff in the blue box? Can’t remember the name. if you are buying your lard already rendered, look for the words “partially hydrogenated” or “hydrogenated” (which I believe you will find on the blue box). Avoid that stuff. I have found Fields Lard at Save A Lot here in Oregon but recently, they quit carrying it. I am currently looking for a source but I think I will have to start rendering for myself. – Search “butcher” in your area. Seldom with the employees of the grocery store have what you want. It is best if you can find one where the animals come from a local source – not IBP (my opinion). Stop in during a not so busy time of the day and chat with them. Tell them you are new to this. They are a WEALTH of knowledge. I just had to share that I had a different experience at my WF. I asked at the meat counter about the lard, and they were really nice. they said, no, but that they did have a whole bunch of scrap fat which they usually sell to someone, but they gave me a little bit for free. :) I’m not sure whether or not they would sell me some if I wanted more, but I have been thinking about asking. Since they are selling that fat to somebody, why wouldn’t they sell some to me?! However, it is all mixed up, so it won’t just be pig, but also bison and beef etc. altogether. ps — I forgot to mention that I hae seen “pork belly” at several places, and I have been thinking this is what they make bacon from but it’s not seasoned etc., yet (maybe?) . I’m not totally sure, but maybe it would easier to call butchers and ask for pork belly. sorry if someone said that already. Pork belly is indeed what bacon is made out of. To make bacon from pork belly you need to cure it(either with sodium nitrate/nitrite or with something that contains sodium nitrate/nitrite such as celery salt) and then once cured smoke it and it becomes bacon. Jenny, What an encouraging article for anyone trying to eat sensibly! I would love to try this type of lard. My great Grandpa used to eat lard sandwiches, so I figure the real stuff has to have flavor! When I lived in Germany, my neighbors would eat rendered goose fat (Schmalz) spread on wonderful dark German bread. I was horrified at first, but it’s truly addictive! You can use chicken fat for the same purpose. http://en.wikipedia.org/wiki/Schmaltz There’s nothing like lard for making the best pie crust. And do you have any suggestions of where to source hog fat? Beautiful photos, and thank you so much for generously sharing your knowledge! this is my question too, what is leaf lard? When I’ve gotten lard from the farmstand, they’ve said it keeps a month unfrefrigerated & for months frozen. Thank you! This blog was so timely. My 1/2 pig is going to be delivered soon and I want to request the fat so I can render the lard. I just came across your site from Kitchen Stewardship. I like what I have seen so far. This is a wonderful article. I waited 3 hours (three hours!) for the crackings to appear, but it never happened, and since I have a life to live and didn’t have time to wait any longer, I just filtered it and put it away. Now it looks nothing like the pictures – it looks very unappetizing, in fact… It’s pure white along the rim, but dirty-looking and sunken in the middle. I think I’ll have to find a day when I have time to stand by the stove all day and redo it. Wait… it can be redone, can it not? I think my problem was that all the tutorials I studied lack a mention of the fact that even if I increase the amount of fat to render I’m NOT supposed to increase the amount of water accordingly, because it’s NOT an ingredient. And, this is not something a first-timer has any reason to be aware of beforehand. Thank you for this wonderful site. So much good information! I am quite an old man now, but as a kid, we would kill 2,000 to 3,000 pounds of our own pork each year and distribute through our family…I have forgotten more about total hog rendering than most would ever know that didn’t work in a slaughterhouse. You need a blog of your own! I, too, would love to hear more about your story. It is pure history of the way life was, not sugar-coated, but real! Please continue to share! Much blessings to you! LC, thanks so much for sharing this history. What a special memory that so many of us younger folks will never know. This is a good thing to strive for on a small family farm. I agree…more first hand stories!! Also, someone asked about beef fat as a substitute to pork…I don’t think it works, we killed our own beef as well, and I remember my grandfather (born right after the civil war) said that it ‘would sour’ and he wasn’t wasting his time for such a risk…whatever that meant…figure it was a crap shoot for not souring, so we never did it. LC, Thank you for this wonderful story! I’m going to read it to my children. I wish I could hear more….. Anyway, I may continue looking for pastured pork but what do you think of that pork? Any guidance on the estimated timing for how long to cook until the crackly pieces sink to the bottom? Should this be started in the morning? Thundering Hooves went out of business and Blue Valley Meats has continued their work fabulously. It is not possible to raise pork entirely pastured. They do the best job of raising it naturally though. There is more information on their website about how their raised. Leaf lard is “A drier, frimer fat from inside the cavity. (Raw, not rendered)”, from BlueValleyMeats.com. I’ve been told it is superior for pastry. You actually can raise pork 100% pastured. My pork is 100% pasture-raised. You’ve got a wonderful blog here! I’m not quite ready to do the 28-Day Real Challenge just yet, but I think your blog is going to be a great resource for my family as we try and eat more real foods and less processed goods. This post is fantastic as I’ve been looking for an alternative to the transfattyness that is vegetable shortening from the grocery store. So, I think I rendered lard (on accident)…. As you may know, I’ve been very challenged in the area of roasting. It’s been turning out like leather. It was 2am when I woke to the most wonderful smell in my house. All the water had cooked off. I put in the garage, where it’s cold, until this afternoon. I just had if for lunch and it was fantastic! And I have some lard to boot! I used a pork shoulder roast ~ and yielded 1/2 cup or so lard for maybe a 2 or 3 pound section of meat. I learned my tried & true method from my aunt- season your meat a day before you’re going to cook it (I do a rub with Worchestershire sauce, soy sauce, garlic powder, onion powder, celery salt, & pepper). Wrap it up completely in tinfoil, and put it in the crockpot on low for 8-12 hours. It turns out very moist every time. It also isn’t overly fatty as the juices tend to leak out slowly (you have 2-4 cups of juice in the bottom of the crockpot) so when you remove the tinfoil from the roast, it’s ready to serve. That’s so awesome, Annie! I bet the roast was incredible, and that lovely snowy white lard – perfect for frying potatoes or braising vegetables. Don’t you love how you can use and reuse the food, minimizing waste? It was great seeing you, if only briefly, at CFMA last week. LC, thanks for sharing your memories with us! I just love hearing stories like yours! I am of Italian decent, Our grandparents cooked using lard, made biscuits and bread with it, The traditional old world Italian cooking used lard. the best tomato sauce was started with lard and salt pork or prosciutto fat, try it sometime I will guarantee you will eat the plate and your knuckles . Their are plenty of foods that got a bad rap especially in the 60 s , the nitrate scare was a big line of b.s. , the mouse had to eat 50 pounds of bacon to get the amount of nitrates for the test..If you use common sense and don’t over indulge in the consumption of these foods they will not hurt you. P.S you stomach has nitrated , you will die of botulism if nitrates where not present. Do you know if beef tallow can be processed in jars to keep on the shelf? Do you mean processing beef tallow as in pressure canning it? I wouldn’t do that, but it can be rendered in the same manner as lard and, thanks to its high saturated fat content, is shelf-stable at room temperature much like coconut oil. I bought some “pork kidney fat” from the farmer’s market yesterday and spent the afternoon rendering. It definitely has a stronger smell than I was expecting but I haven’t tasted it yet. Does it mean I did something wrong if it has a strong smell? (it was my first time rendering). I wanted to use it for pastries and vegetable dishes but I’m not sure I can do so if it has a very “porky” taste and smell. The second time, we used a lower temperature, and poured the fat off twice. The first pour was milky white and pure, the second had the porky aroma. We ended up with two grades of lard, essentially, one for baking, one for cooking. I’m receiving my first delivery of fresh hog fat this afternoon and will begin the rendering as soon as it has been cleaned up. I’m wondering what to do with the attached skin? I’m told the hair has been completely removed and that the skin is a creamy white color. Should the skin be cut away before the rendering or left on during? Make Pork Cracklins with the skin! It should be removed before rendering, to avoid that porky flavor soaking into the lard. I just bought a 10 pound bag of lard slabs from my grass-fed beef source, and stuck it into the freezer until I learned what to do with it. Now I have! Thank you! I know what I’ll be doing Saturday! I’m rendering chicken fat as we speak…can I store it the way you store tallow and lard? I’ve been storing the liquid leftover from cooking bacon in a jar in the freezer, will it do ok in the cupboard as well? Thanks. I’ve heard/read that chicken fat is not stable for storage and later cooking (part of the reason it is best skimmed from broth). However, I’ve had leftover chicken bits from whole chicken that I’ve blend with ezekiel bread crumbs, egg and spices then fried in the leftover chicken fat with some leftover bacon grease (pork tallow with smoke flavor). This is my version of chicken nuggets and it’s delicious. chicken fat (schmaltz) can be saved for later use, it just needs to be refrigerated (or at least kept very cool). You also want to make sure that any fats you want to store long-term, whether under refrigeration or not, have been strained very well. Generally, it is the impurities that make the fats go bad, not just the fats by themselves. What about the saturated fats? Aren’t they still present after the fat is rendered? Quick question: are the “cracklings” in the bottom supposed to be soft or crunchy? I guessed from the name that they would be crunchy little bits of goodness. Mine are soft and mushy. Did I do something wrong? I simmered for over two hours. After rereading your instructions, I have another question about my “cracklings”. As everything in the pot melted, not everything melted. Is that why I have mushy thingys instead of cracklings. There was a lot (a lot) of “meaty” or sinew-y stuff that never melted that I strained out before putting my lard into jars. Maybe my fat was too meaty? I received it all cubed already so I didn’t have to do anything to it before melting it. Is my mushy stuff good to use still? How long can the unrendered fat be left in the refrigerator (after thawing) before it will go bad? Mine was in the fridge for a while because I didn’t have an appropriate pot to put it all in to render it. Is it still okay to use considering it is a “meat product”. It was over a week, maybe even two, I honestly don’t remember. I don’t want to kill my family, but I don’t want to loose such a precious product either. It smelled fine when I opened it to check before putting it all in the pot. I hope I didn’t wast three hours today! :O) (It smells funky in here now, but I don’t know if that’s normal or not.) Any opinions anybody? The fat will smell moldy if it’s bad. I’ve had it in the fridge for quite a while before and just cut off the slimy bits and it was still fine. Thanks for this post–had just bought some leaf fat and needed some guidance. It came out great. You have a great site! Lard got a bad rap at the same time we also stopped using coconut oil here in the states – during World War II. Until then all commercial fryers were full of lard & our baked goods full of coconut oil (NOT Palm). During WWII the US’s supply lines for coconuts & coconut oil was cut off for several years. We filled the gap with home grown, cheap vegetable oils. When the farmers & companies here were about to lose their greatly increased profits when coconuts & coconut oil were again available they took it to the politicians to save their income. The companies who didn’t want to spend more again to replace the cheap oil with healthy oil paid for “Studies” to support how bad coconut oil was & how good vegetable oil was. The farmers managed to get lard literally outlawed in restaurant fryers & replaced with low-smoke-point, highly carcinogenic veggie oils which was bought from them. It’s makes me sad & sick. I don’t know where you got your misinformation that the farmers had anything to do with taking lard or coconut oil off the market. They and the American consumers have been made pawns by the major food corporations and nearly driven out of business. As Joel Salatin says, it’s not about food safety, but denying access to local produced, organically grown safe food. The major food companies and the big pharmacuetical companies and the american medical association pepetueated the myth that food from animal products and coconut oil were bad and pushed the low fat diet fantasy that has led our farmers and consumers down the path to obesity, bone disorders, mental illness from lack of good fats. The lobbyists for the above corporations and the pesticide companies have convinced our government leaders to tell the american people what they can and can’t eat. The war on raw milk is just another lie by the fda and their cronies like monsanto. The farmer has been under attack evers since the end of WW1 and the parity provision in the farm bills in the 40’s made it illegal for a farmer to even charge what his production costs were to sell his produce, meat or milk, much less make a living wage and keep his or her farm or ranch. The Foxfire books have some sections on the old skills practiced in the mountains and other areas that might be good reading. Thank you so much for this post! I’m picking up 5# pounds of pork fat tomorrow to try my hand at this. I’ve started a new dairy free diet so this could be a wonderful substitution in our diets that will work for my whole family. Rendering pork fat seems like a much thriftier option than butter too! They are charging me only .59 per pound. Thanks again! How long will this store? Should I store it in the frig? Thanks! Thanks for your blog and your instructions! I can’t access your flicker photo’s either, and I would really love to have see to them to walk me through this process. Is there a secret to being able to view them? Thank you!! Rendering one’s own lard, while sounding good, does not change the fact that pork in any shape or form, is not intended for human consumption, it is not food, and we should not be encouraged to eat it! We’ve already addressed that issue here in the FAQs: https://nourishedkitchen.com/frequently-asked-questions/#using5. You also ignore the fact that pork has featured widely in traditional diets the world over, and as a traditional food with near-global use, it is absolutely encouraged here. Gail, who told you that pork is not food and should not be eaten? I wouldn’t trade my home rendered lard for anything. Makes the best homemade french fries, pie crusts and sugar cookies on earth. Here are a few places you could see about buying leaf lard (to render yourself); some only sell the already rendered stuff. You’ll have to decide what you can afford, how much time you have if you want to render your own, etc. When I render it takes a whole afternoon. It’s not a fast process. Hope those are helpful to someone! I also hope all those links work! Where did this prejudiced bit of wisdom come from? Religion, PETA, Vegetarian, or non-informed self. Fact all most all animals, birds, insects, and fish will eat all forms of meat if given the opportunity. Thanks for the blog! I tried my hand at making lard and am glad I did. It turned out white and creamy, just like your picture. I plan to keep up with it so that it is a staple in my kitchen. Just ordered some leaf lard from my co-op. Wasn’t sure if this was the right stuff but ah ha it is and now I know what to do with it. Thanks! My boys are off to slaughter our first organically grown pig today! we were told that this heritage Berkshire pig will not have much fat because its been raised on raw milk, coddled milk, butter milk, vegetable scraps and sprouted barely and oats. I guess we shall see if there is enough fat to render some lard! I dont want them to remove it all off the meat. I’m curious if you got plenty of lard? I was told heritage breeds are fatter. Thank you for these simple instructions! Somehow I thought that rendering fat was more difficult. We buy our pork by the hog and always end up with big bag of fat. Time to make some lard! So I made this and the fat is cooling now in little mason jars. I have a question. I only had about a 3/4ths of a pound of lard to render. I followed the directions to a T but the cracklings never fell to the bottom of the pan and the lard started smoking. Having faith in directions, I waited for the cracklings to hi the bottom of the pan. Now, the lard is turning a creamy color but it has a strong smell like burned oil in a pan left too long on the stove. When do I know to take the oil off if my cracklings never hit the bottom and this happens? I’ll use this lard but I want to make sure that I’m more careful in future so I can actually use this lard to bake some beautiful pastries with! It sounds as though you cooked it at too high of a temperature, especially for such a small amount of lard – this can cause the fat not to render fully and start to smoke. My husband is wanting fries and we are trying to figure out how to make them with a healthier fat. Would lard be a good choice? It seems to me that I’ve heard that it is, but I can not remember for sure. If we do use lard, can it be reused? I was wondering why you add water. I usually just place the chunks or strips of fat in a cast iron skillet on low heat. Thank you for the recipe I’ll be giving this a go next week. I very much enjoy your blog and its information! We just purchased a whole pastured organic hog & were able to get all the lard. I just finished rendering it. We have a bowl of cracklings & 7 quarts of lard! I am SO excited!! I used to have to pay $10 a lb for organic pastured lard! Just remember fat stores the worst chemical toxins. For all meat organic is best; local raised non-organic next; store bought in complete desperation only. Almost all pigs in the country are corn-fed and the corn crop is now all GMO and dosed with incredible amounts of chemicals (unless certified organic). I would urge moderation in usage for that reason alone. One great thing about lard is that you can obtain this fat and render it yourself unlike almost all oils. In a survival situation pigs are fast to grow (if you can hold them in)., they will eat almost anything, gestation period is short, litters are large, and they can be butchered yourself (with some instruction) This is one reason cultures from around the world depend on the pig. Downside is they are somewhat hard to contain, the manure is not too fun to deal with, they are subject to some diseases that humans can contract, and some people get attached to them and then keep them until they weigh 800 pounds. This is an older post, but I’m hoping someone will see my comment and advise. I cut the excess (over half a pound) fat off my pork roast and figured it was good practice to render it since I had it. It seemed to work very well, but it doesn’t seem to be thickening as quickly as I expected. I put it in the fridge but I’m wondering if maybe I didn’t get all the water out of it? Should I put it back in the pot and cook a little longer? Thank you! Thanks for this post! My mother and grandmother always cooked with lard, loved butter and fat. I guess the saying “my mother was right” is really true! How long does rendered lard last? Do you store it in the fridge or freezer? Several months, and, like all fats, it can be stored at room temperature. Can you simply cook with the lard as is or do you have to render it? I bought some beef lard from U.S wellness meats and I’ve just been cooking with it without rendering. Can you use cow fat or any other fat for rendering lard? My lard is still very spreadable when refrigerated. Is this normal? If it doesn’t smell ‘off,’ would just use it up quickly. It was stated earlier that the impurities are what make it spoil more quickly. I have a silly question…is it raw fat or can I use the fat from a cooked brisket? This is my first time attempting it and want to make sure I know what I’m doing. Thank you. I have a couple pounds in my freezer that I can try this with. I’m a newbie to the gaps world. I just rendered tallow I bought at the farmer’s market in Union Square ( NYC) and rendered it and then made burgers and fries for my kids- organic potatoes fried in the lard and grass-fed beef! i feel like I just did a major accomplishment! I got out the fire extinguisher as I was so frightened of the rendering/frying process that I feared burning down our building…no worries! It was step-by-step simple and not scary at all, once I got going! Pretty good for a city girl!!!! Hooray! And once you are done rendering the lard from the fat, cool down the fried fat—–and EAT IT! It is really good! Just make sure it is cold, otherwise it will give you a stomach-ache! I don’t understand the purpose of the water in rendering the lard. I have done it that way and it turned out to be rather dangerous for me as the water would pop as it got down to the last bit of water evaporating. I literally had hot cracklins flying all over my kitchen and decided never to do it that way again. I use a crockpot and scoop off the lard as it melts. When I get down to the bottom and there is junky stuff in the fat, I just use some cheesecloth and filter it before storing. I feel like this may be a stupid question, but is there a limit on the number of times lard can be re-used? I know that it’s a very stable fat and stands up well to heat, but can it be used twice in cooking? I’d love to fry my Thanksgiving turkey in it (and get away from the traditional peanut oil used every year), but I don’t want to waste all of that lard after the turkey is done, especially since I plan to spend the next couple months leading to Thanksgiving rendering all of it myself. Can it be strained, stored and re-used? How long can you keep lard in the fridge? Ours always grow mould after a few weeks between the fat and the bowl. It is the water, but how do you get rid of the water? I rendered lard a little less than a week ago and it smells slightly sour. Is this normal? Is it rancid already? If so, why would it be rancid so quickly? I am in the process of making lard for the first time. Ground-up backfat from the hogs a lady kept to help clear their newly purchased land. It seemed to take a while to cook down but I think I started too cautious / too low heat. I read the blog here and decided to pour off what was there now and if I get more later maybe this first pour will be more white and neutral and the longer cooked might be the more porky-flavor and eventually get cracklings from the residual. Had to turn it up to medium low to get anything to really happen, then it started sizzling etc. making lots of sounds and liquefying more. Got it poured in some Adam’s PB jars now with lids on tight, thinking as it cools and contracts (everything expands when hot and contracts when cool, right?) the lids might seal down tight and allow for fairly long storage in fridge ( FYI Adam’s PB jars are glass, larger than a quart, with a wide mouth and metal lid. Adam’s PB is not hydrogenated and made with just 2 ingredients, peanuts and salt). I did get a few brown bits in the top of the lard but mostly just mushy white bits. On one side of the pan bottom they did seem to “sink” as there was a layer of clear liquid above them, but the other side of the pan the material seemed evenly dispersed suspended in the liquid all the way to the surface. I read the responses on here and didn’t want to overcook my lard so I drained off what was there and will try to render some more in the morning. This way I may get a baking-quality lard (seems to be fairly clear in the bottles now, we’ll see its color and taste once cooled) and if the second cooking is more porky in flavor we will use that for fried potatoes, eggs, etc. Then I expect those white mushy noodle looking bits (this was put through meat grinder, similar grain/ size as hamburger I think when it came out) will probably become the cracklings. NOTE: I used a stainless steel homebrew kettle with spigot on the bottom. I highly recommend this. Safer than ladling or pouring hot fat which seems like a recipe for a hospital visit and skin grafts O.o You cannot use a homebrew kettle for this and then use it for beer again because any trace of fat will damage the head foam of the beer, and you cannot also get any detergent residue in beer either and it would take detergent to de-grease the pot. So it is best to not use a brew pot you would use for making beer for this. But a spigot-bottom stock pot or brew pot is a great tool, I’m glad I got one. Going to be a lot safer and less messy than ladling or pouring from pan when making stocks, lard, maybe jellies, etc. I have MS and it affects your strength and coordination sometimes so dealing with a pot of hot fat seemed like something I should avoid, thus the spigot.There is a mesh screen tube you can attach to the inside spigot that strains out pretty much most particulate, that is used when making stock, and also came in handy for this lard making. I could have used a cloth and colander as well but honestly it was so clear coming out through that screen tube I didn’t bother, since it is going to be stored in the fridge. If I planned to can this lard to store long term at room temperature I would also strain through a cloth, though. I am going to pick up a portable electric single or double burner to be able to do this on the porch because it does have an interesting smell and eventually made me cough due to fat vapor in the air. I am making sure to eat high quality animal fats these days because I have MS. The brain is mostly fat, some water and a little protein. But mostly fat. We need high quality fat, including saturated fat, for proper brain function and myelin production (the coating on nerve fibers in brain, spine, and eyes). It’s also important for mood (which is also neurological), learning disorders, and to process the fat soluble vitamins like vitamin D. (Vitamin D is crucial for the immune system). I went through an eating disorder from age 8-16 where I ate extremely little fat and very little animal protein. I think that had something to do with stripping the fat off my myelin and out of my nervous system. Have been vegetarian and vegan for many years. And consumed plenty of transfats in my time. Also the purified vegetable oils like Wesson etc. Like most americans, I had no idea how harmful this was to neurological health and general health until studying more I found we have been sold a bill of goods that led to nothing but ill health in americans today. Dr Terry Wahls cured her own MS with a protocol she now calls the Wahls Protocol which among other things involves eating organ meats, healthy natural animal fats and good fats of all kinds, no refined fats or transfats. So, I am now working on giving my body healthy natural fats to build up the neurological system. It’s no mistake that the rich were able to learn easier and keep their position in society when they had the most fat to build their brains, etc., as opposed to the poor who lived on mostly carbs. You can make carnitas in the process of rendering lard….Yummy! May I use this lard for making pie crust? If i salt this will it taste like bacon grease? Nope. Bacon also has sugar and is smoked. Does the lard can well? I have limited freezer and fridge space at the moment. I don’t bother to can it, but I believe you can (pressure can) it. What is the best way to preserve the fat for long term use? Can lard be frozen after it has been rendered? Once rendered properly, you can pressure can it or freeze it but it will store in a dark container in a dark cupboard for a few months. Question: If I pour the lard in jelly jars do I need to cold pack the jars or just let the heat of the lard seal the lid? Somehow I didn’t fully read the instructions and I did not trim off the excess meat. There wasn’t much on there but there is some. Will it still work? I don’t necessarily need to use my first batch to make pie crust or anything like that. You’ll probably be fine. It may cause discoloration in the lard, and it may have a meatier taste, but it’ll probably be okay. Bacon has meat on it and bacon fat renders beautifully.